Kaye (co-owner of BladeRubber Stamps) and I were chatting, as you do, when I took the wreath in for her shop window - and I happened to mention my Christmas decorations (3 trees this year). 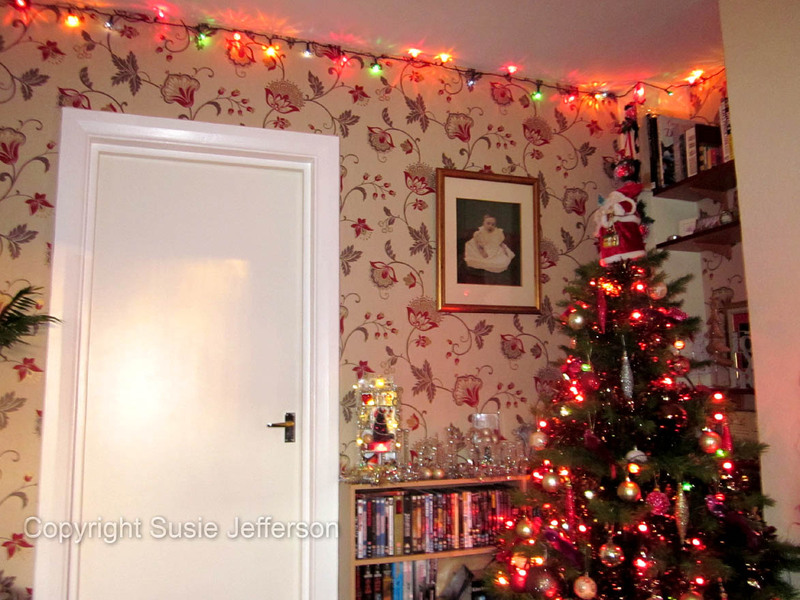 Kaye couldn't believe I could get 3 Christmas trees in the one living room. Hah! Oh yes I could! 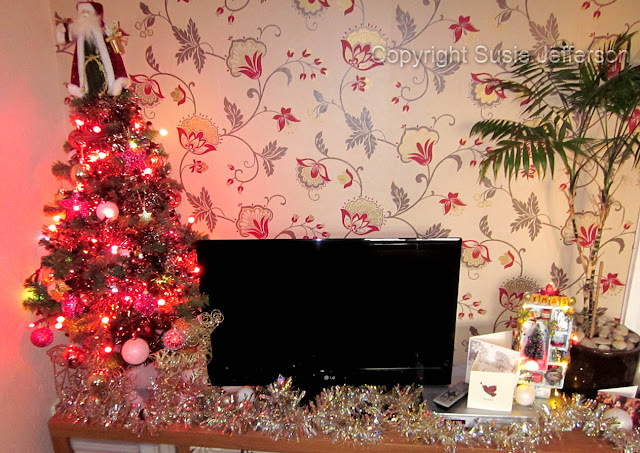 Panning around the room, starting from the far left, here's Tree No 1 (4ft) next to the television. One of my Configuration boxes to the right of the television. The TV bench is on the left of this door, lights strung right around up at the ceiling and Tree No 2 (6ft) with 3 sets of lights and another Santa. Another Configuration box is on top of the bookcase. Closeup, showing Tree No 2's tree skirt. Fireplace on the right. Tree No 2 (6ft tree) on left, Tree No 3 (3ft tree) next to the computer desk on the right. 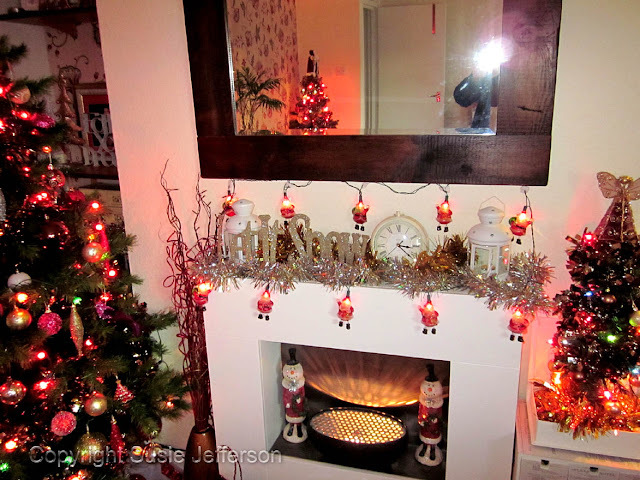 Fire in the middle, with Santa lights on the mantlepiece. Tree No 3 has only the one set of lights and now feels very underdressed. That's it for now... you can tell I just adore Christmas! How are your decorations coming along? Got your tree up yet? Goodness Susie that's what you call decorating for Christmas!! Not a decoration in sight at our house but hopefully that will be rectified this weekend. Have a good one!! 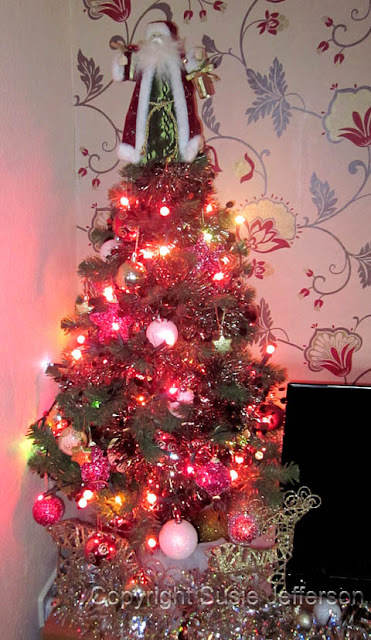 Beautifully decorated trees... in fact your room looks wonderful. I'm just back early from an aborted "holiday" in Devon, due to the bad weather, so have yet to start! I can tell that you are a Keeper of Christmas all right! Thanks so much for leaving a comment - we adore Christmas (you can tell) and all the decorations went up on the 1st as we couldn't wait any longer. 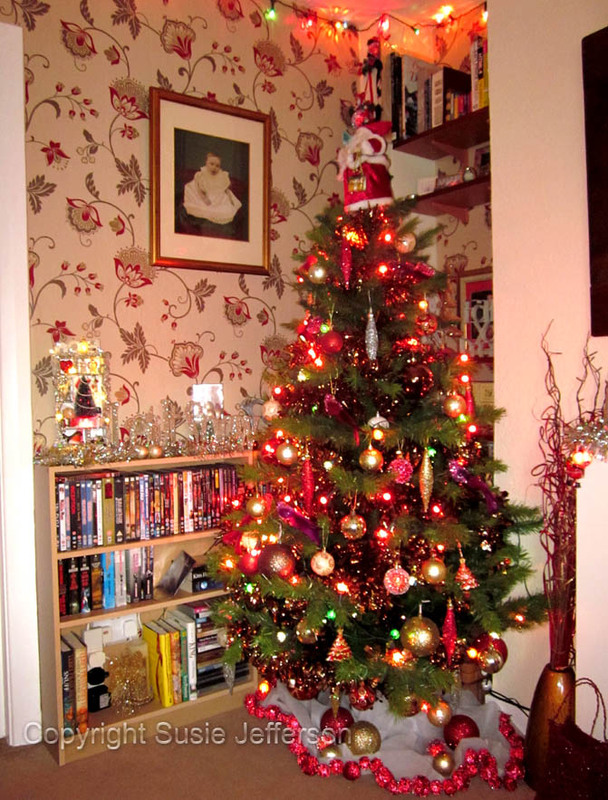 I'm already planning next year's - it's going to be even more over-the-top, although I don't think I can squeeze in another tree (sob). It looks sooooo cozy Susie !!! Wishing you a phantastic Christmas feast !!! Just gorgeous! You made such a lovely holiday home. I love the fireplace. We have been crazy busy and I am making a resolution to blog again in 2012.